Alien Bee: SPARTACUS: GODS OF THE ARENA DVD/Blu-ray Releases Get A 3D Bonus Feature in September! 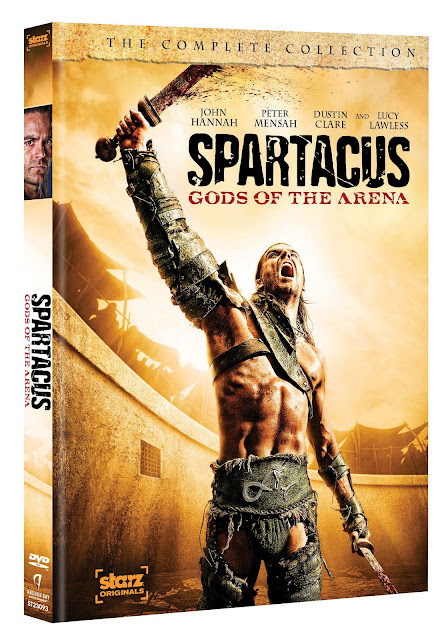 SPARTACUS: GODS OF THE ARENA DVD/Blu-ray Releases Get A 3D Bonus Feature in September! Who's ready for some more cool Spartacus news! This time in 3D! Beverly Hills, CA – “SPARTACUS: GODS OF THE ARENA,” the exciting STARZ Original series, is ready for battle when Anchor Bay Entertainment releases the prequel to the acclaimed “Spartacus: Blood and Sand” on Blu-ray™ and DVD September 13, 2011. The two-disc collection contains a muscular amount of bonus features including never-before-seen featurettes, bloopers and behind-the-scenes footage (including a set tour with star Lucy Lawless). The Blu-ray is even mightier with extended episodes, audio commentary on all six episodes and a mind-blowing battle sequence in 3D - a first for a TV on Blu-Ray™ release! A sneak peek of the 3D bonus feature will happen at the STARZ booth at Comic-Con 2011 in San Diego. Audio Commentaries On All Episodes (including: Writer/Creator/Executive Producer Steven S. DeKnight, Executive Producer Rob Tapert and actors John Hannah, Lucy Lawless, Dustin Clare, Jaime Murray, Peter Mensah – and more.